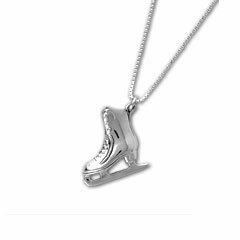 New: Figure skating discussion forum for fans and skaters. Accessible via the web or via newsreader. (2003) Culture on Ice: Figure Skating and Popular Culture by Ellyn Kestnbaum. (2004) The Second Mark : Courage, Corruption, and the Battle for Olympic Gold by Joy Goodwin chronicles the Salt Lake City pairs judging scandal. The 2002 Olympic Games - Figure Skating Competition/Exhibition video in VHS! Skating icons. Fun images of figure skates and skating-related organizations. Skater Support: "for people who want to help support up-and-coming skaters!" Fundamentals of Alignment and Classical Movement for Figure Skaters by Annette Thomas. Her Ballet for Figure Skaters program, the subject of the book, utilizes Russian technique ballet combined with Pilates and Yoga based floor exercises to increase body awareness, centering and core strength, relating everything to the specific artistic and technical needs of the figure skater. 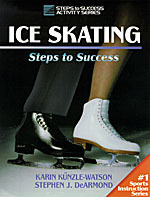 The Complete Book of Figure Skating guides you through all the skill levels of figure skating from beginning to advanced. Written by Carole Shulman-former competitive skater, Master PSA instructor, professional figure skating judge, and the current Executive Director of the Professional Skaters Association-this resource provides clear descriptions of proper technique for more than 100 skills performed at all levels including singles and pairs skating. You will learn how to move across the ice with increasing speed, style, and grace as well as stopping and stroking skills, freestyle moves, turns and footwork, spins, jumps, and lifts. Special teaching exercises and tips will also help you master the most difficult components of each skill. In Ice Skating: Steps to Success, Karin K�nzle-Watson-nine-time Swiss National Champion, former Professional World Champion, and one of skating's best instructors-shares the learning sequence that she and many of her students used to become elite skaters. Karin's unique insights along with over 300 detailed illustrations make this guide your best source for learning proper form and technique. (2002) It's Never Too Late to Figure Skate, by Lisa Maliga. "Not only is it written for beginning adult skaters, by someone who's been there, it�s available as an e-book, on CD and in booklet formats... The practical information found in this book has been based on the author's ten years of experience, along with other adult figure skaters whom have thoughtfully shared their insights." SkateStyle Instructional Figure Skating Videos by Ann-Margreth Frei, Olympic competitor, three time Swedish national champion, triple gold medalist, and star in the Ice Capades and Holiday on Ice for over fifteen years. 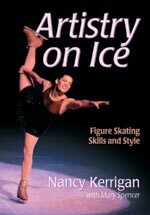 In Artistry on Ice: Figure Skating Skills and Style, 1994 Olympic silver medalist Nancy Kerrigan shares her knowledge to give you the inside edge on winning competitive events. From body alignment and effective routine elements to refining the fundamentals of footwork, music, and expression, Artistry on Ice: Figure Skating Skills and Style gives you an in-depth look at the sport from the perspective of one of its champions. After a quick look at the basics, Kerrigan concentrates on advanced techniques for jumps, spins, moves in the field, ice dancing, pairs, and synchronized skating. You will also find four chapters devoted solely to competition, covering the music, choreography, costumes, and other elements to create the total package. (1998) The Inner Chamption: A Mental Toughness Training Manual for Figure Skaters, by Choeleen N. Loundagin. (The Inner Champion web site) The Inner Champion is written for skaters of all levels and disciplines who want to realize their full potential. (1995) Figure Skating: A Celebration, by Beverly Smith, et al. The Art of Figure Skating Calendar by Barry Mittan -- 16 month 2002 calendar starting with September, 2001 through December 2002. My Sergei: The True Story of Sergei Grinkov VHS. For Your Eyes Only VHS. Roger Moore as James Bond, Lynn-Holly Johnson as the figure skater. The Spectators Video Guide to Figure Skating by Ann-Margreth Frei, Olympic competitor, three time Swedish national champion, triple gold medalist, and star in the Ice Capades and Holiday on Ice for over fifteen years. Figure Skating Superstars: Katarina Witt and Friends. Reel.com Amazon.com Katarina Witt, Viktor Petrenko, the Duchesnays, Christopher Bowman and more. VHS. Fairy Tales on Ice: Alice Through The Looking Glass. Nancy Kerrigan skating, along with Charlene Wong-Williams, Tiffany Chin, Scott Williams, and Natalie and Wayne Seybold. Narration by Geena Davis. VHS. Magic Memories On Ice 2: Golden Performances Scott Hamilton, Katarina Witt, John Curry, Kristi Yamaguchi and Paul Wylie. VHS. Nutcracker: A Fantasy On Ice Dorothy Hamill and Robin Cousins with The National Philharmonic Orchestra. Hosted by Lorne Green. VHS. Nutcracker On Ice Oksana Baiul. VHS. Skating & Gymnastics Spectacular Skaters Boitano, Fleming, Cousins, Sumners, Martini & Underhill and gymnasts Comanceci, Conner, Pagano, perform together in Vail, Colorado. VHS. World Champions On Ice 1 1991-93 Worlds. Skaters include: Baiul, Bonaly, Bowman, Browning, the Duchesnays, Eldredge, Ito, Kerrigan, Petrenko, Yamaguchi. VHS. World Champions On Ice 2 1994 World Championships. Skaters include: Baiul, Barna, Bonaly, Candeloro, Kwan, Stojko, Brasseur & Eisler, Gritschuk & Platov, Meno & Sand. VHS. World Cup Figure Skating 1994 Exhibition performances of Lisa Marie Allen, Barna, Fadeev, Kadavy, Manley, Tickner, Klimova & Ponomorenko, Valova & Vasiliev and others. Hosted by Tai Babilonia and Randy Gardner. VHS. Also see above under particular skaters sections. Video Sports Productions specializes in figure skating videotapes. 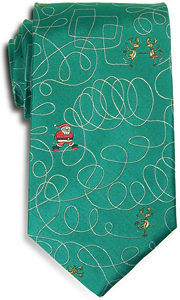 Kringle on Ice necktie by Lee Allison. FigureSkatingPatterns.com, a fashionable line of figure skating dress patterns designed by Adorn Figure Skating Apparel.